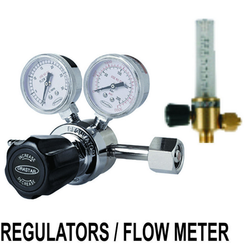 This is a single stage flow meter regulator, which provides precise regulation and measurement of gas flow. This is well suited for a wide variety of industrial uses. These products are highly appreciated amongst our clients due to their optimum quality and long functional life. Salient Features High strength Alu-Alloy body precisely machined for accurate and smooth flow. - Valve seat made from Poly-urethene for atleast 5 to 7 times life of natural rubber. - Poly carbonate break resistant tube for flow meter and flow meter precisely tuned for smooth flow of gas. Leveraging on our vast industry experience, we are providing a high quality range of Pipeline Regulator. 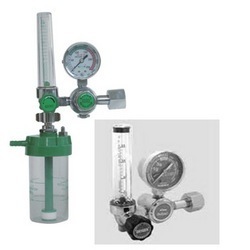 Weld Safe Tradelink (P) Ltd.
ESAB India is the manufacturer of Single Stage Argon Flowmeter Regulator.This is a single stage flowmeter regulator, which provides precise regulation and measurement of gas flow. This is well suited for a wide variety of industrial uses. - Rated flow : 25 lit/min. We deal in electromagnetic , digital & magnetic flow meter. The UFT-FluidCon Vortex Flow regulators operate without moving parts, exclusively under the effect of the flow. New deltawave ultrasonic flowmeter is much more than a standard transit time device - it is ultrasonic multimeter. Measuring multiple velocities in pipes, partially filled pipes, channels and rivers, deltawave is able to determine complex flow profiles and measure accurate under most complicated situations.